En Ka Society, Inc. strives to support projects that address the needs of students and youth, the elderly, the physically and mentally challenged, and non-profit organizations devoted to providing community enrichment, and health and social services. Download Grant application form from this website or obtain from Gifts Chair. Contact the Gifts Chair, Kathy Massa, at gifts@enkasociety.org with any questions. Fully complete the En Ka Society Grant Application. Include Financial Statement. Grants will not be reviewed without financial documentation. Include an itemized budget if the request is for a project or is comprised of multiple components. If you choose to mail in your application, please send a brief email notifying them of your submission to Gifts@EnKaSociety.org . Each grant will be reviewed on its own merits, within the boundaries of the guidelines and in comparison to other requests received that period, regardless of whether it was approved or declined previously. Only one request per organization will be granted during En Ka's fiscal year, September 1- August 31 of the following year. If your request was declined, you may re-submit. If multiple requests are submitted, only one request will be considered. En Ka encourages applicants to apply to other organizations for support. Grants may be recommended for full or partial funding or may be denied. Applicants will be contacted as to the decision of the committee and the En Ka Board. Approved grants will receive funding to the organization and address indicated on the application. Approved grants are publicized and applicants are encouraged to participate in the En Ka Fair Parade. 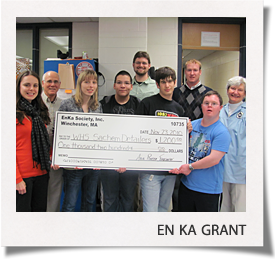 En Ka Society, Inc. appreciates public acknowledgment of grants.